It is reputed that the infamous pirate John Avery was born in Newton Ferrers in about 1653, and was one of Britain’s most renowned pirates of the late 17th century. In the sheltered waters and secluded creeks of this small estuary of the River Yealm one can image the young man’s imagination for his future career being cultivated! He became the model for Daniel Defoe’s hero in “Life, Adventures, and Piracies”, of the Famous Captain Singleton (1720). This relatively little known area, on the national scale, offers an absolute haven for yachtsmen, and pirates! Set as it is, just to the east of Plymouth Sound. 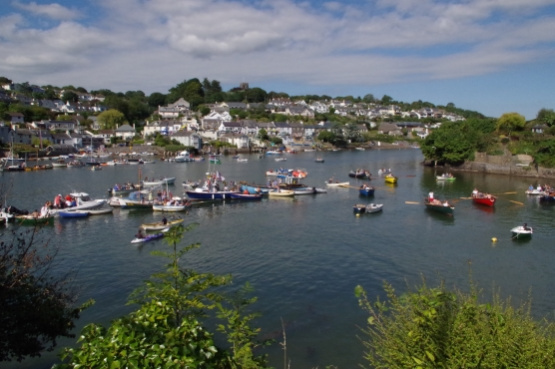 It offers something completely different to the popular spots of Salcombe and Dartmouth in that the twin villages of Newton Ferrers and Noss Mayo are quiet, proper villages, which do not become congested and offer a real option for those looking for a more secluded life. Yachtsmen love this place, due to the proximity of Plymouth, a mere ten miles away, with its world class marine facilities. Walk the many footpaths of this estuary and more is revealed. A gem is the foot ferry across the mouth of the river, linking across from the Wembury peninsula. For those more energetic the Warren walk, starting from the tennis courts in Noss Mayo, in a clockwise circuit around the National Trust headland has a breath-taking long view over the Mewstone, across the mouth of Plymouth Sound, and down the Cornish Coast. However, for those of a more nosey nature the village paths provide tantalising glimpses of some of the most beautiful homes in the region. Ingenuity and inventiveness abound here, heaven for architects and artisan builders alike, capitalising on the opportunities provided by the ever changing and distracting views of this sheltered spot. With all of this there is an assumption that this is an area dominated by second homes, but it is not. This is a proper community with a thriving primary school, vibrant U3A, Post Office, supermarket, butchers, pharmacist, three pubs, two churches, and a Yacht Club. The summer regatta is an example of community involvement, when for the month of August the families of the villages take part in all manner of sporting activities, many of which are not water based. The confidence of the young people manoeuvring their craft and naturally diving into the tidal waters, given half a chance, is a clear example of a proper upbringing – these are locals! Roger Punch, FRICS, is a Chartered Surveyor, and a Consultant to Marchand Petit. He is also the RICS’s South West Regional Property Spokesman.